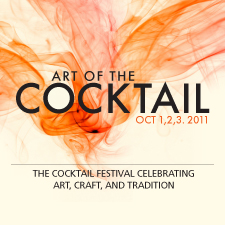 A lot of time has passed since the Art of the Cocktail festival in Victoria, but I'm still going to talk about a couple seminars I went to because they were not only engaging but extremely informative. First of all, I should say that the festival was tons of fun and extremely affordable for what you get - it's more than half the price of the Tales of the Cocktail festival that was just in Vancouver yet it has basically all the same events. There probably aren't as many spirit companies and personalities attending, and definitely not the same crowds (I mean, it's Victoria), but it was still a hell of a party. The tasting night alone was worth the price of admission, where you wander around a giant conference area in which spirit, liqueur, and restaurant representatives show off their products and offer you "small" samples (" " because some of them were definitely full-sized) of their choice of cocktail and food. Each drink cost you a ticket, each worth a dollar, and you get 5 just for showing up. The most valuable part of these festivals is probably the seminars, though, as you can hear famous and decorated personalities from all over the world talk about the world of alcohol and mixology for a good hour. Every seminar focuses on something very different, and they aren't just for people in the industry. I feel like I chose the best of seminars, as I had the pleasure of world-renknowned cocktail and spirit personality Philip Duff discuss "neutral" spirits, and Darcy O'Neil from www.artofdrink.com discuss the science of taste and how flavours interact with each other. Today I'll focus on the former. Duff was actually there as a representative of a new vanilla vodka by Cariel that sponsored the seminar, and luckily was charismatic and smart enough to take things in an interesting direction and keep us all entertained. I say that because vodka is boring and flavourless (literally), and flavoured vodkas are, for the most part, full of artificial additives, bad flavours, and are cheaply produced spirits. So, Duff not only found a really exciting direction to take us all, he also spent most of the seminar on one particular subject - neutral spirits. Vodka is just a distilled neutral spirit that has been distilled more times over to remove all flavours and colours. Water is added to dilute to the appropriate proof, and voila, there's your vodka. But what does "neutral spirit" mean, exactly? If a grain is germinated, fermented, then distilled, the product is a "neutral spirit," meaning that nothing has been done other than the aforementioned processes. If the neutral spirit is then aged, it can be considered a whiskey, if the neutral spirit is steeped in juniper and other herbs, it can be considered a gin, and so on. Similarly, grapes can be fermented (wine) and distilled to give brandy, malt wine can be distilled to give genever, and again - so on. So often you will hear a spirit or liqueur use the term "neutral spirit" when describing the process by which the product is made, and none of us really give a thought as to what the neutral spirit is because it's, well, neutral. But is it? The general understanding is that this spirit is flavourless and for all intensive purposes identical to all others regardless of the material from which it was distilled. As we came to discover from Duff's presentation, this is not the case. After a (somewhat) brief history lesson on distillation, grains and cereals, and the basic types of spirits, we turned our attention to a series of unlabelled plastic cups in front of us. Each contained a "neutral" spirit, and as Duff went through some information about different kinds of grains and distillation processes, we tasted the raw spirit from each type. I was completely shocked to discover that each of the "neutral spirits" had not only very strong flavours and aromas, but were also all extremely different from one another. For example, the corn spirit tasted like gym socks (you probably know what I mean if you've tried unaged 100% corn whiskey), whereas the wheat spirit was light, grainy and somewhat sweet. Tasting a simple bourbon after the corn spirit was very interesting as I could see how important not only the composition of the mash (mixture of grains) is to the taste, but also the aging process. One of the most interesting cups was one Duff brought as a little treat - it was an unreleased type of genever that was designed to recreate the original Dutch genevers of old. Tasting the malt wine neutral spirit then the Dutch genever was exciting, but the crazy part was then tasting Irish Whisky. I was surprised to notice the similarities. 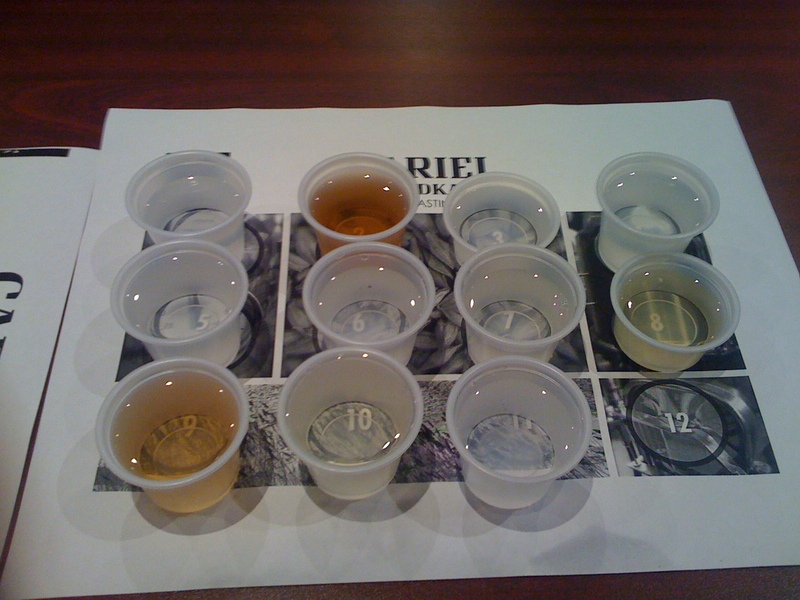 Eventually, in the last couple minutes we finally arrived at the sponsor vanilla vodka (which at least is flavoured with natural vanilla) to show the process come full circle, and of course value Cariel for making their vodka from a specific kind of wheat. It was an extremely valuable experience for my palate, and extremely informative for someone interested in spirits. I never really thought about exactly what the neutral spirit might be in a product, but now I can't stop wondering any time I taste something. I've also started thinking a lot more about the mash of whiskeys. Taking a sip of Bulleit, Buffalo Trace, or Wild Turkey bourbon I can't help but notice more spice notes from the higher rye contents in comparison to ones like Maker's Mark and Knob Creek. Furthermore, I can't help but wonder what cheap brands of any kind of spirit use as their base because so many don't list anything at all (most major, cheap brands are actually made at multiple distilleries in multiple locations around the world, then all blended together in an attempt to achieve a solitary flavour). I'll be back tomorrow to chat a little more about Duff's presentation, but also to briefly discuss vodka. Click here to see "Neutral Spirits Part 2." I can't figure out why this post gets so much traffic. Found this because I was curious about the REAL difference between distilled spirits like vodka, whiskey and rum. For example, Vermont Gold make vodka from maple syrup, but seems to me that maple sap would naturally lend itself to creating a spirit more in line with rum. Similarly, for grain based vodkas, what's the real difference between that and something like whiskey? It seems to me that it may just be the difference between aging, filtration and multiple distillation. I believe the phrase that caught my eye was "Vodka is just a distilled neutral spirit that has been distilled more times over to remove all flavours and colours"
Great question! This post is essentially just on my experience tasting neutral spirits. Most western world countries have similar laws governing exactly how spirits can be defined. Bourbon for example is very specific (see below), whereas absinthe is not legally defined at all, and vodka has very few specifications. Vodka is distilled multiple times and often filtered to remove any flavours and colours, so whether it begins with maple syrup or potato or wheat the final product will have basically none of the characteristics of these base ingredients. There are no laws governing exactly what its made from, which also means that very cheap vodka is made very cheaply, sometimes involving simply industrial-grade ethanol. Vodka also has no laws on additives. Rum is a interesting spirit because it is so incredibly diverse. It has very few specifications as well. The point is to appreciate the flavour of the sugarcane juice/molasses/etc, however, so multiple distillations or any kind of filtration is rarely if ever used, which is why rum has the taste it does. Aging plays a huge role as with any spirit, added caramel, vanilla, and wood flavours, and softening the alcoholic edge as with whiskey. As for whiskey (again, see the links I gave you below), the key is aging. Vodka is unaged, rum can be aged or not, whereas whiskey MUST be aged. So to answer your question, if you take rye grain, ferment it, then distill it multiple multiple times and maybe filter it to at least 40% ABV, you have rye vodka. If you take rye grain, ferment it, distill it, then put it in a new charred oak barrel for at least 2 years, you have rye whiskey. I am also new to distillation and had googled about the specifics behind what a neutral spirit really is. Is genever considered a neutral spirit? Could it be used as a base to create liqueurs? "Neutral" implies that nothing has been done outside of distillation. So if you ferment a rye mash then distill it, or distill fermented grapes (wine), etc, those are neutral spirits. If anything else is added or the spirit is aged, it is no longer "neutral." For that reason, genever is not a neutral spirit because like gin, it made by macerating herbs IN a neutral spirit - in this case, distilled malt wine. As for liqueur bases, you can use anything you want depending on the effect/flavour you want. If you want to make an orange liqueur with only a strong orange flavour, for example, your best bet is to use a high-proof neutral spirit like grain vodka (ex. Cointreau). If you want a more full-bodied and complex flavour, you could use a brandy base (ex. Grand Marnier). Choose your base depending on the flavour profile you want. Same thing with bitters - I make orange bitters at home using high-proof vodka, apple bitters using bourbon, and lime bitters using rum. This was incredibly informative. I am at bartending school and was researching neutral spirits for my class. This was a great read. I dont drink so I love reading the history of different spirits and wines. I'm very curious how you're getting along as a bartender if you don't drink! How are you developing your palate? I hope you are at least tasting things - this is an extremely important part of the learning process. It is also a practical necessity when mixing drinks as you need to be checking for corked/stale ingredients, mistakes, dilution, balance, etc. I would never trust a drink if the bartender didn't taste it before serving it to me. Anyway, hope the schooling goes well. Cheers! Great article & comments. I came looking for what differences are apparent between grape and grain neutral spirit. I would like to try my hand at making amaro and other herbal liqueurs and also need some "defense" against the upturned noses of my family when I tell them I used Everclear :) Very good to have Cointreau as an example of a liqueur that is made with grain spirit. They love that stuff. Thanks. I am looking up the difference between vodka and white whiskey, and neutrality in general. I am still a bit confused to why vodka can't just be distilled multiple times at whatever proof until neutrality is reached rather than the first time distillation at 190 or 95%.